The nature of planets orbiting stars in other systems will be the focus for ESA’s fourth medium-class science mission, to be launched in mid 2028. The mission addresses one of the key themes of Cosmic Vision: What are the conditions for planet formation and the emergence of life? Thousands of exoplanets have already been discovered with a huge range of masses, sizes and orbits, but there is no apparent pattern linking these characteristics to the nature of the parent star. In particular, there is a gap in our knowledge of how the planet’s chemistry is linked to the environment where it formed, or whether the type of host star drives the physics and chemistry of the planet’s evolution. Ariel will address fundamental questions on what exoplanets are made of and how planetary systems form and evolve by investigating the atmospheres of hundreds of planets orbiting different types of stars, enabling the diversity of properties of both individual planets as well as within populations to be assessed. Observations of these worlds will give insights into the early stages of planetary and atmospheric formation, and their subsequent evolution, in turn contributing to put our own Solar System in context. “Ariel is a logical next step in exoplanet science, allowing us to progress on key science questions regarding their formation and evolution, while also helping us to understand Earth’s place in the Universe,” says Günther Hasinger, ESA Director of Science. 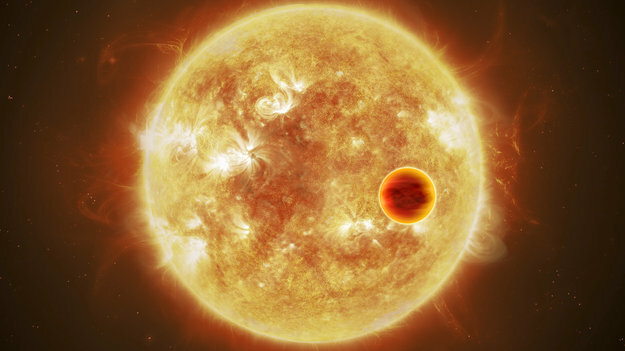 The mission will focus on warm and hot planets, ranging from super-Earths to gas giants orbiting close to their parent stars, taking advantage of their well-mixed atmospheres to decipher their bulk composition. Ariel will measure the chemical fingerprints of the atmospheres as the planet crosses in front of its host star, observing the amount of dimming at a precision level of 10–100 parts per million relative to the star. As well as detecting signs of well-known ingredients such as water vapour, carbon dioxide and methane, it will also be able to measure more exotic metallic compounds, putting the planet in context of the chemical environment of the host star. For a select number of planets, Ariel will also perform a deep survey of their cloud systems and study seasonal and daily atmospheric variations. Ariel’s metre-class telescope will operate at visible and infrared wavelengths. It will be launched on ESA’s new Ariane 6 rocket from Europe’s spaceport in Kourou in mid 2028. It will operate from an orbit around the second Lagrange point, L2, 1.5 million kilometres directly ‘behind’ Earth as viewed from the Sun, on an initial four-year mission. Following its selection by ESA’s Science Programme Committee, the mission will continue into another round of detailed mission study to define the satellite’s design. This would lead to the ‘adoption’ of the mission – presently planned for 2020 – following which an industrial contractor will be selected to build it. Ariel was chosen from three candidates, competing against the space plasma physics mission Thor (Turbulence Heating ObserveR) and the high-energy astrophysics mission Xipe (X-ray Imaging Polarimetry Explorer). Solar Orbiter, Euclid and Plato have already been selected as medium-class missions.